Red is the color of Life, the force of the will to live. The eagerness to be alive, to create, mhm…to procreate, is palpable all around us in the first month of Spring. From March 20 through April 19 the Sun in the Northern hemisphere passes through the constellation of stars, which the Ancients named Aries. We may feel the urge to assert ourselves while still being vulnerable from the cold season. The young sprouts possess a tremendous force, enabling them to break the seed and push through the soil into the light. Yet, at the same time, they are very fragile. The eurythmy gesture of Aries, the Initiator, pulls the forces of will with the right arm from the depths below. The hand stops in front of the chest and points its fingers to the chin. All the processing we have done in the Winter has yielded us the strength and confidence to stand tall, sensitivity to connect with our heart, and courage to offer fresh ideas to the world. The eager Ram shines in life-giving red and gives us the consonants V (as in Victoria) and W (as in water). The eurythmy gestures for these two consonants are like waves, arising from the primordial air and waters to create life as the Nature awakens with the Spring Equinox. 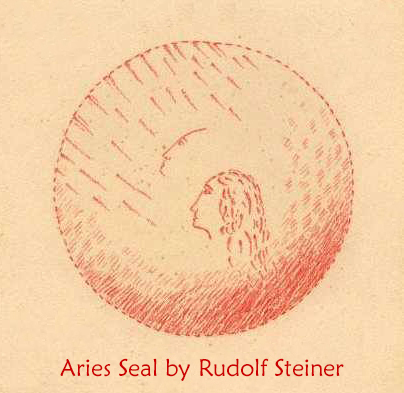 As far as I know, Rudolf Steiner never gave any indication for the image of the gesture V. He was even reluctant to bring its movement to the eager eurythmists at the beginning of the 20th century. Finally, he gave in, and offered what he perceived about the energy of the sound V from his visits to the spiritual worlds. V is a wave-like movement of the primordial wind, breathing Life onto the Earth. 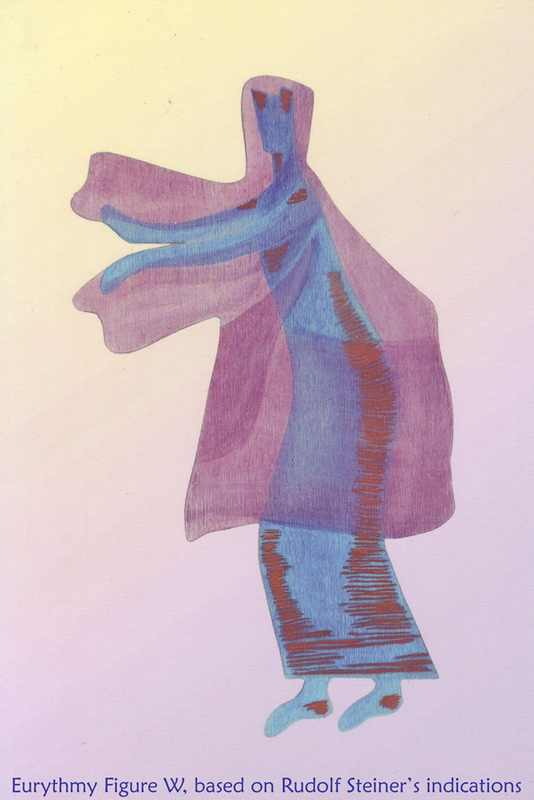 The eurythmy gesture for W goes deep into the blue primordial waters to stir up Life on the purple thoughtful feeling, encouraged by the red purpose. The image above, created based on the Rudolf Steiner’s indications for W, is a representation of the etheric forces engaged. O shine of Light, abide! “Arise, O shining Light.” The Sun invites us to wake up into our own Light. “Shining Light” can be interpreted as Soul Awakened. Awake, O Soul. “Take hold of growth and becoming,” encourages Venus. Grow into your dreams, manifest them into the world of matter. “Lay hold of the weaving of forces,” advises Mercury. Become part of the streams of creation. “Yourself ray forth, life-wakening,” continues Mars. Push through the membranes of separation, Go through the channels of rebirth into the awakened Life. Jupiter adds much needed advice about how to lead this earthly existence: “In face of resistance, gain.” Learn and gain wisdom as you encounter and overcome challenges on your path of rebirth into Spring. “In stream of time, disperse,” says Saturn, The Father of Time. Mhm, “in stream of time, disperse”. This one requires some pondering… It’s about time management. In today’s world of computerized technology, we tend to rush and be rushed, without pause. But the faster we move, the denser we become. The denser we are, the less we can move. We become less pliable, less open to change, and more the creatures of habit, stagnant in our ways, stack in the mud of dried up life stream. So fast into faster is a wrong approach to time management, if you will. Because it’s a straight line fast lane to death on all levels. But Saturn proposes the alternative in this verse for the beginning of Spring… Disperse in the stream of time. Relax, breathe, and shine your true Light into matter. Spring Equinox is the moment of perfect equilibrium. Continue to nurture your balance of thinking, feeling, doing as you move onwards through the ever-changing flow of Life. Be firm and steadfast about one aspect of existence only: to shine Light. “O shine of Light, abide,” echoes the Moon, the Keeper of Ancient Wisdom. May the Spirit’s clarity shine through the Truth and Beauty of human art. Bring your dreams to Life; rejoice in your own creations. May your inner striving renew the Spirit’s Strength. May your inner peace nourish you; may your Soul’s depth enrich the Spirit. Take a few moments each day, or at least once a week, and write down in your journal current sensations that arise in you, as well as the memories of the experiences you’ve had in the past years during the month of Aries. Observe if you tend to be full of excitement in the first weeks of Spring? Do you get more assertive, or do you feel more vulnerable and fragile during this time? Write down in your journal the memories and the sensations that arise in you. The influence of the Arian energies may be stronger for you if any part of your name contains the consonants V or W, or if your Sun, Moon, or any of the five main planets in your birth chart, are in the sign of Aries. And listen to the Soulful Sparks Radio’s episode for additional pearls of wisdom from the Aries and the overview of the first four weeks of Spring. Support Soulful Sparks Radio and hAmoves Eurythmy. Your contributions are greatly appreciated. Thank you. Donations are safely processed via Podbean’s Crowdfunding. which will appear on your statement.